Armada is a North American-exclusive Sega Dreamcast game. It is a multi-directional shoot 'em up with RPG-style progression. 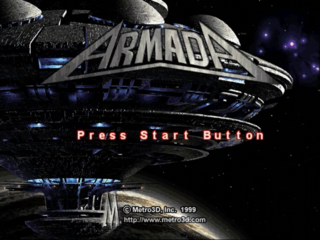 Armada was slated for release in Europe by Acclaim, though this version was cancelled at the last minute for unknown reasons. The North American version was itself delayed, having originally been planned as a launch title for the system. After ten thousand years of space exploration, mankind has evolved and adapted to the conditions of different worlds, diverging into various subspecies. However, a biomechanical hostile alien species known simply as the Armada has attacked Earth. Seeing their ancestral world in danger, six of the tribes reunited to form the Allied Command and fight the aggressors.